I was interviewed by a journalist I really admire for one of the local weekly papers. I think the feature is being printed on my birthday. Wish You Were Here is being reviewed next month in a magazine I love and have been reading for almost 15 years. I am so excited about seeing that review! 1) Someone painted a cover for my book — that’s a dream come true! 2) The artist totally got what I wanted for the character. Before I saw the painting, Raena was just words and a hazy image in my head. Now she’s sort of a real person. I apologize for all the vagueness. Hopefully, I can reveal more soon. In the meantime, I’ve been working on my slides for my talk about the pioneer cemeteries of San Francisco at the Death Salon next month. That’s been a process of whittling down all the stuff I know and making it fit the time I’m allotted. I am really, really excited to talk about San Francisco’s history at Fort Mason — and I cannot wait to see all my Death Salon muses again. And we got a new kitten. She was feral and has needed a lot of love and attention, more than I expected. I know pets are supposed to bring your blood pressure down and extend your life, but my last two new pets have had the opposite effect. Hopefully, she will adjust to the fact that people like to move around and settle in at last. Her name is Amulet. Finally, I wrote a series last week about the National AIDS Memorial Grove on CemeteryTravel. I’m really pleased with how the pieces turned out. Please check them out starting here: http://cemeterytravel.com/2014/09/16/touched-by-a-cemetery-the-national-aids-memorial-grove/. This entry was posted in The Weekly Morbid, writing and tagged #deathsalonsf, Amulet, The Dangerous Type. Bookmark the permalink. Congrats on the interview, cover art, and new baby furball! Love the name Amulet, and her wonderful, wary face. Thanks, Stephanie. It’s good to hear a success story! Things with Amulet seem to be getting better day by day, but she still cringes when we move around and hides most of the day. Hopefully, in time, she’ll get used to living in a house with people. I’ll pass on a critical piece of advice Hubby and I ignored from the woman who captured Mistress (an experienced Feral Rescue volunteer): Be Gentle But Insistent (and Consistent) in Touching/Stroking Amulet to Quicken the Socialization Process. We didn’t do this because 1) everything we’d read indicated cats learned by watching, 2) Mistress cringed and tried to run like Usain Bolt when we approached (yes, deja vu! 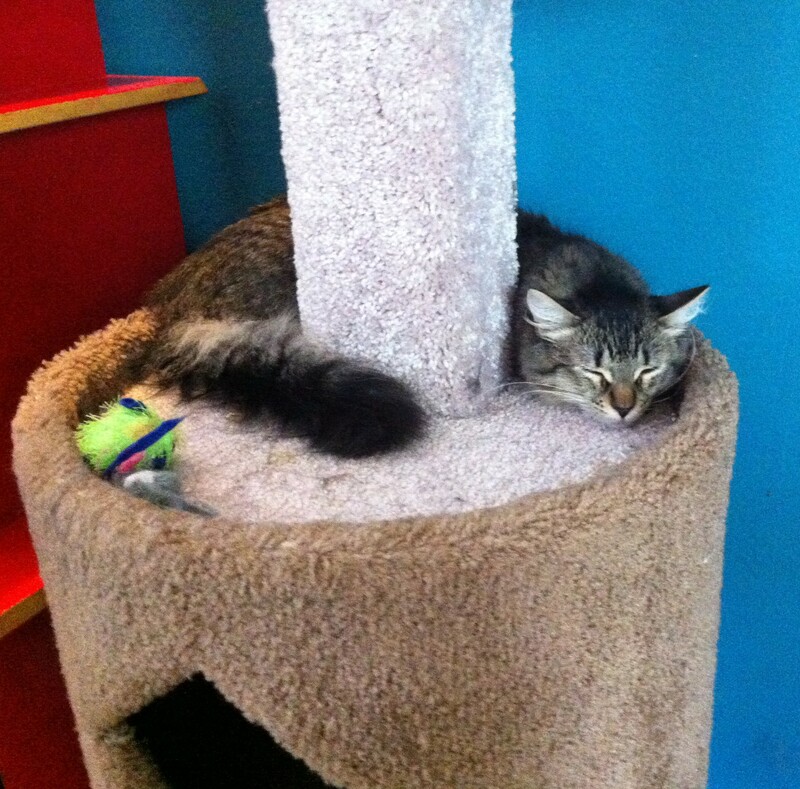 ), and 3) we figured she’d catch on after watching us interact with our other two cats. Sue told us that Ferals are NOT wired like domestic cats, and you have to BE BOLD in breeching their “trust barriers” with repeated positive encounters and interactions — and she was right!!!!! They’ll initially fear and hate you for “forcing” your affections on them, but a glorious day arrives where you brace yourself for more rejection, “go in” and assault them with ear scratching, neck scruffing, and perhaps even a dangled catnip mouse, and they suddenly lean into your hand or give you a quick “marking” swipe with their cheek — it’s frickin’ GLORIOUS!!! Think Helen Keller making the connection to the wet stuff pouring over her hands and Annie Sullivan repeating the Sign lettering ad nauseum for W-A-T-E-R. A New Day dawns, and a New Relationship is born. A tiny little kitty realizes that the chick that opens her food cans and scoops her box is also one hell of a masseuse, and might even be pleasant to sleep with. She’s crossed a line and is FERAL NO MORE!